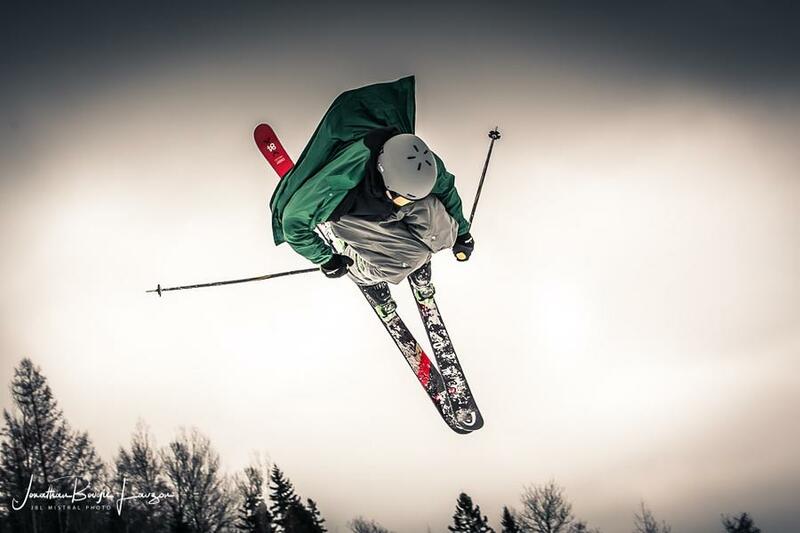 The athlete you see in this image is called Édouard Therriault, a young 15-year-old freestyle skier who is currently in full ascension to the pro ranks. I’m absolutely certain that one day we’ll be watching him on our televisions as he competes in the Olympics. He really is incredible and exceptionally talented. This shot was taken at the Maximise training centre in Sainte-Agathe-des-Monts in Quebec, Canada. In fact, this is the same place that trained Olympic gold medallist freestyle snowboarder Sébastien Toutant, an individual who really is the best in his field. I happen to know Édouard’s father so I was able to organise a shoot while he was training. It was there that I was able to capture his incredible skills and style. The trick you can see him executing here is called a triple cork 1440 where a skier makes four full 360-degree rotations in the air. It was a tricky shot to get focused and to ensure I captured the motion at exactly the right moment, but I did it. After I got the shot, I imported it into Lightroom where I tweaked the contrast and clarity, desaturated it slightly and then added a couple of graded filters here and there. All of that combined gives the image a darker mood that I think works well for the final image. Visit Jonathan Bougie-Lauzon’s Photocrowd page. Before taking this shot, I’d seen quite a number of dancer and powder pictures doing the rounds. 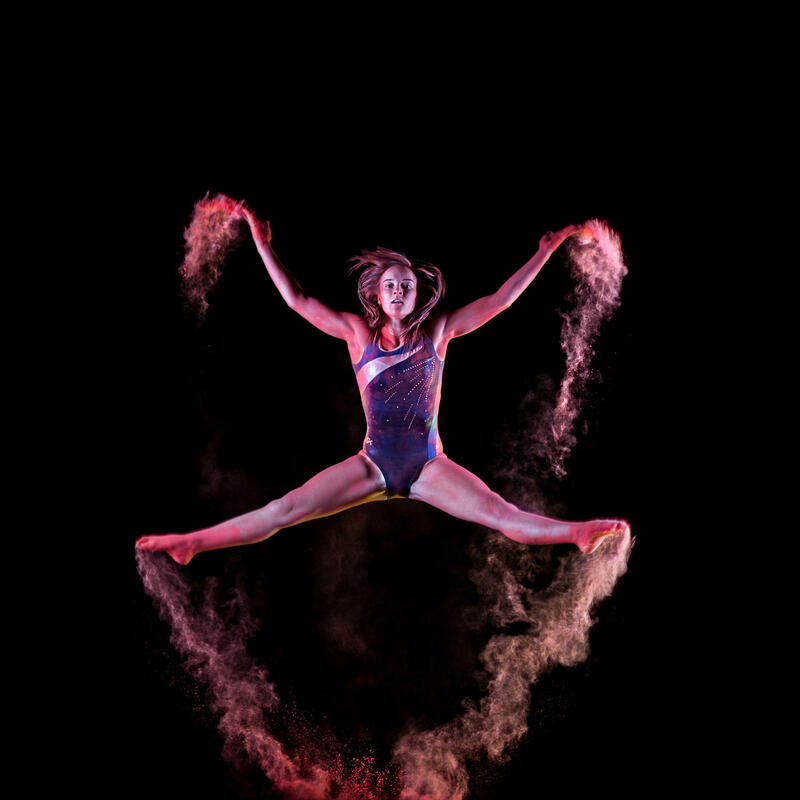 The plan was to try and do my own version but a little bit different –instead of using a dancer, I decided to go with a gymnast. My wife, also a photographer, was more than keen to help and happened to have a friend who is in charge of a gymnastic group at a school in our local town. We knew the event was going to be messy, so the shoot was done outdoors in pitch darkness. We carried a gymnastics trampoline outside and built a platform about 0.5 m higher than the trampoline so the gymnast could jump from there onto the trampoline. For the lighting, I sandwiched two strip-boxes on 400-watt studio lights on either side of the trampoline. I set my camera’s aperture f/8 in order to get a little bit more depth of field because of the movement and set the sync speed at 1/160sec. The ISO was set at 100 to ensure quality in such dark conditions. You can see the set-up in the image below so you can some idea of how it looked on the night. Once the lighting was ready and the camera was set, we filled some buckets with coloured powder, a bio-degradable concoction that’s very safe to use (it’s actually the same kind they use in pre-primary schools for water paint). The powder was then spread across the surface of the trampoline and we also put some in the gymnast’s hair, and on her hands and feet. We took plenty of pictures in order to get 8 to 10 good ones but this one, I think, is one of the real standouts. Visit Deon's Photocrowd page to see more. 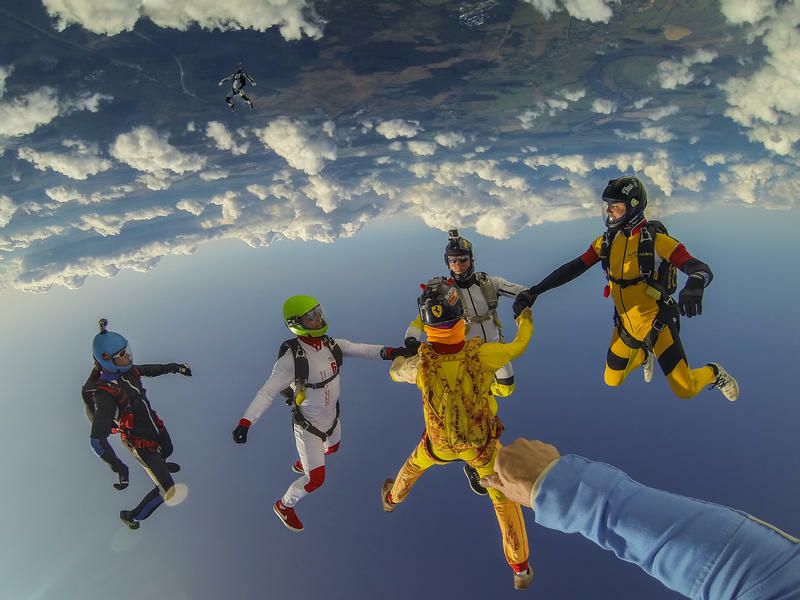 The story of ‘Friends in the Sky' is one that is perhaps more about the sport of skydiving than it is photography. The thing to remember about an organised event like this is that you have to be a skydiver first and a photographer second. In that sense, you need to keep focused, stay safe and remember that your primary concern should always be about you and your team. On top of that, you’re being watched from the ground by judges who are scoring your performance. You have to stay close to your friends and mimic what they are doing. Then somewhere in there you have to take your images. There are some key things to keep in mind as a skydiving photographer. Your camera must be installed on your helmet. The simplest way to achieve this is to use an action camera, such as a GoPro Hero3, the model I used for this shot. A full-body DSLR like a Canon or Nikon will be a serious obstacle because of its weight. Your shutter speed also needs to be fast as you and your friends are plummeting to earth at 300km. 1/1000sec is ideal but less is better. Additionally, the lens should be wide to capture everything around you. This picture was taken during a jump at my home dropzone in Kolomna, Moscow. But often my friends and I travel around the world with our canopies, jumping in a variety of places. It’s not only sport activity. Often, it’s just for pleasure. The landscapes we visit are often extremely beautiful when viewed from above. Small islands with reef barriers, mountains, deserts – it’s breathtaking to look at when you fly above it.